Username for login is "admin" and password is server's "root" password, which you can find on Clients Portal. - On the right side menu select "Reseller Level". - Then select "Add Package". for package, type in package name and click "Save." - Click "Home" to return to the original page. - Click on the "Add New User". 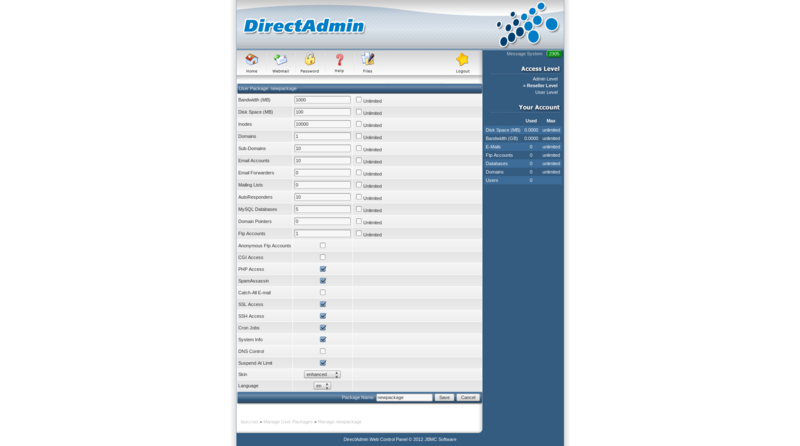 - Enter the user's name, email, password, domain, and click "Submit". - Login as user by click on the "Login as <user_name>". - Click "Create Email account". - Enter the data you want and click "Create". - Click on the "FTP Management". - Then click "Create FTP account". - Enter the data and click "Create". - Click on the "MySQL Management". - Then click "Create New Database". - Here, after entering the database name, user name and password, click on "Create"
- Select the desired website and click "Suspend" or "Delete".